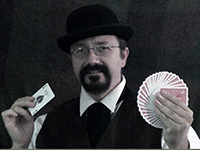 This magician's personable manner and unique personality engage people's attention. Spectators become participants as they take part in creating the magic. Energy and enthusiasm build to a hilarious and tasteful crescendo.